Exclusive to Europe's biggest watch retailer. 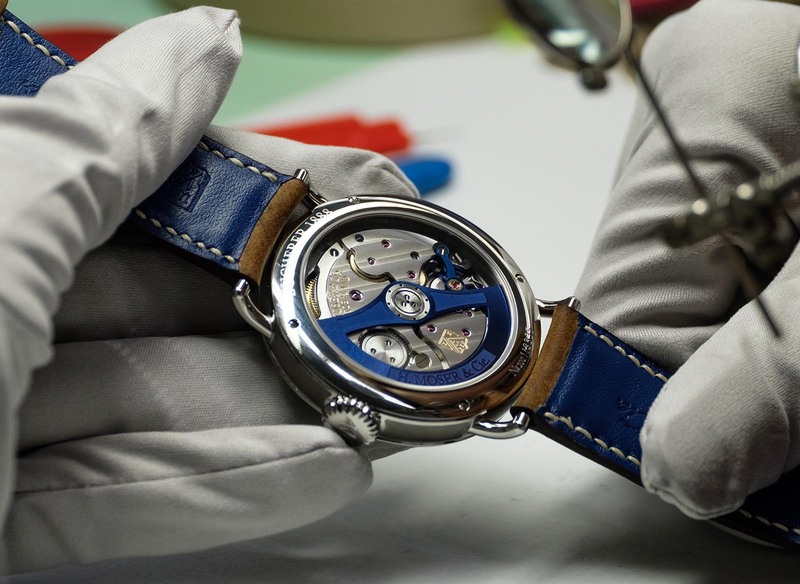 The H. Moser & Cie. Heritage is the latest to join Bucherer’s Blue Edition, a family of watches produced exclusively for the Lucerne-based watch and jewellery retailer. Announced last year in the run-up to Bucherer’s 130th anniversary, the Blue Editions now count almost 20 different watches from the great and the good of Swiss watchmaking, including by the likes of Tudor, Audemars Piguet, Panerai and IWC. Despite the varied brands and designs, all the watches are blue, in one way or another, to reflect Bucherer’s corporate colour. 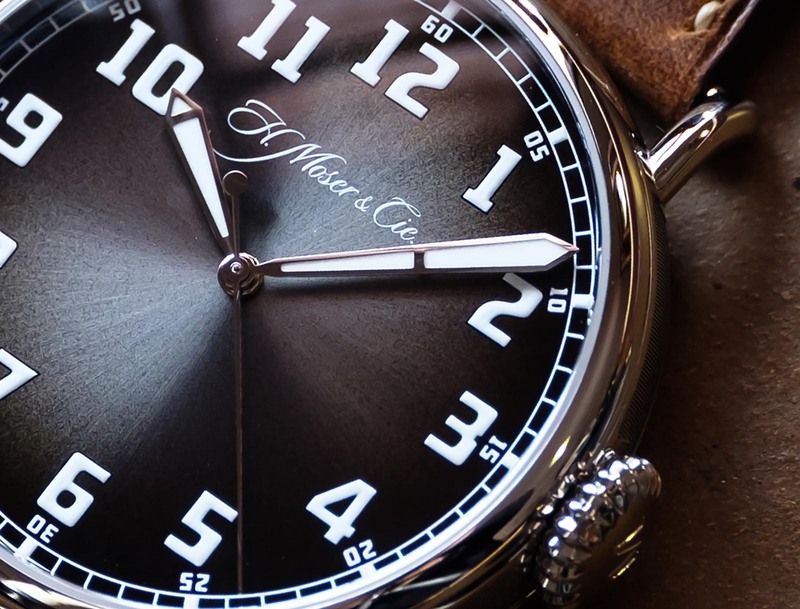 While the earlier Bucherer Blue Editions were variations of existing models, H. Moser & Cie.’s contribution is unique – not just a new model but the first of an entirely new line. And while Moser has already a Venturer Small Second Bucherer Edition – making this its second Bucherer-only watch – the new Heritage does not have a blue dial. The Heritage Bucherer Blue Edition radically departs from anything produced by Moser in recent years (and is also no doubt a trial run for a wide launch of the Heritage line). Instead it’s inspired by earlier aviator’s watches made by Heinrich Moser in the 1920s that are now in the company’s museum. 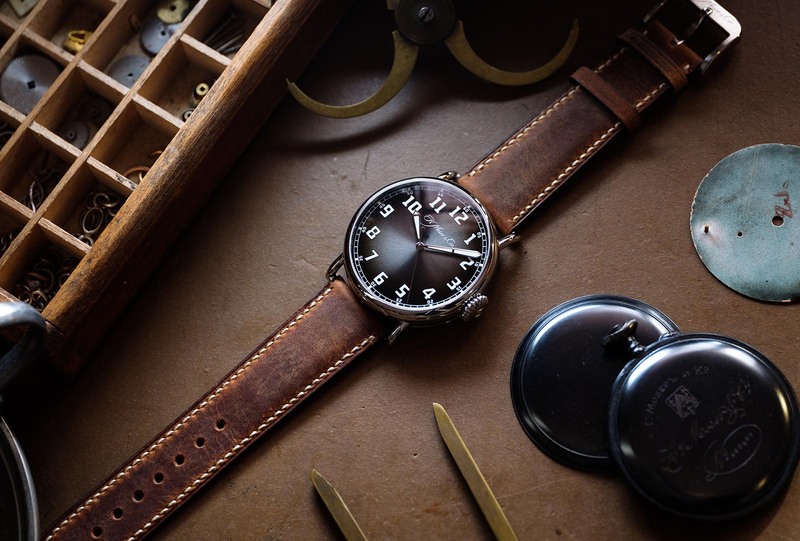 It’s a familiar look, since the style of watch was somewhat generic, characteristic of early pilot’s watches and produced by a host of brands, including Omega, IWC, Zenith and Helvetia. 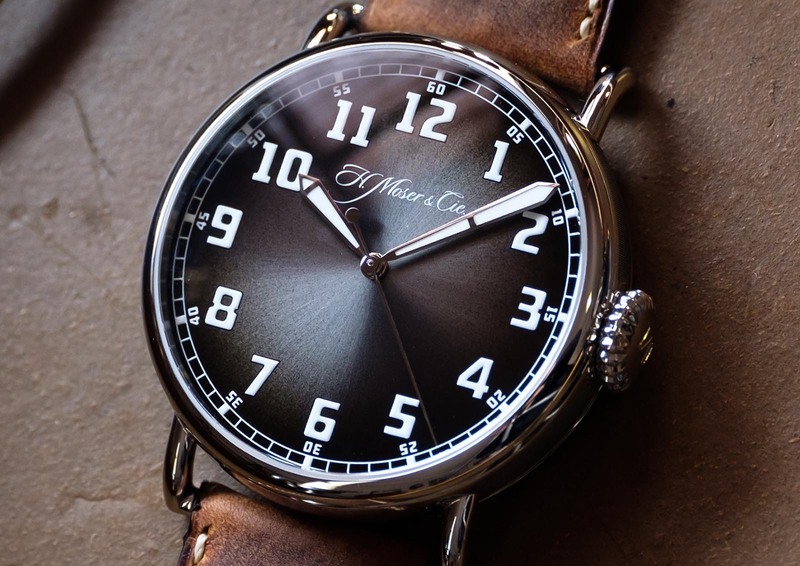 The dial has large Arabic numerals, a railway minute track and Moser’s signature, graduated fumé finish in dark grey. 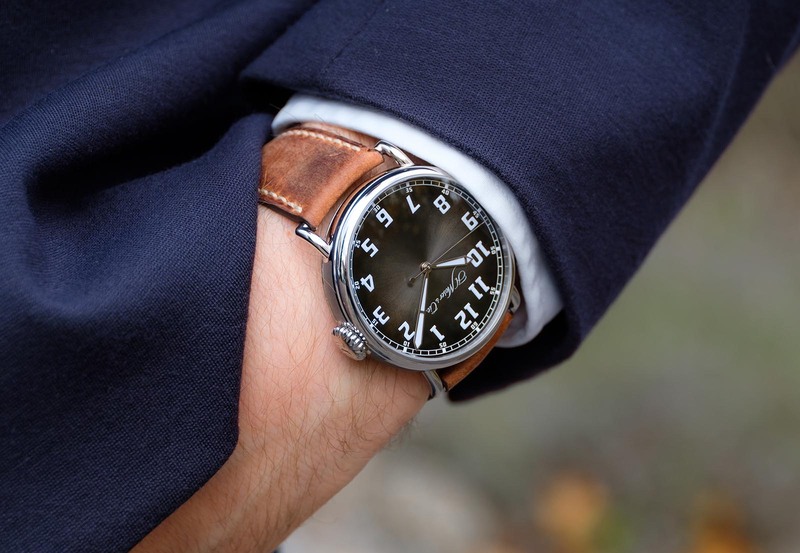 Instead of the cathedral hands typical for this style of pilot’s watch, the Heritage has simpler sword-shaped hands. And the case is stainless steel, 42mm in diameter and 11.1mm high – largish but relatively slim. It has the requisite large, onion-shaped crown and narrow lugs inspired by the soldered wire lugs of early wristwatches that were actually converted pocket watches. While the Heritage Bucherer Blue doesn’t have a blue dial, it does incorporate the colour in the cal. HMC 200 inside. The tungsten rotor, balance wheel and balance bridge are coated in a bright metallic blue. The HMC 200 is the brand’s workhorse, in-house automatic with a three-day power reserve. Despite being the calibre found in Moser’s most affordable watches, it nevertheless has a free-sprung balance fitted with four adjustable gold weights as well as a Straumann hairspring made by Moser’s sister company Precision Engineering. 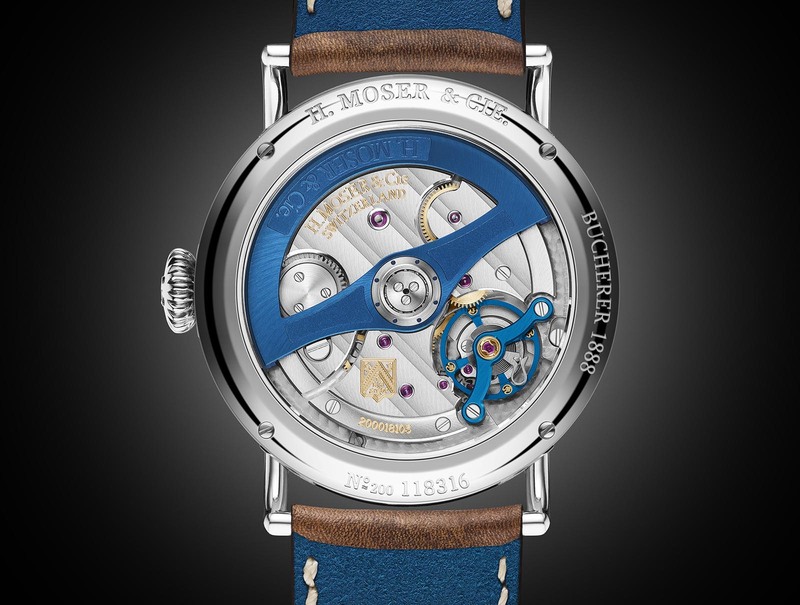 The H. Moser & Cie. Heritage Bucherer Blue Edition (ref. 8200-1200) is priced at SFr13,900 and available only at Bucherer stores.